Dr. Eric Weisbard knows first-hand that the 1990s were a great decade to be writing about popular music. After all, he worked as a rock critic for New York City’s Spin magazine and The Village Voice in the years following the rock band Nirvana’s surge in popularity, which paved the way for hundreds of alternative bands nationwide to receive unprecedented, widespread recognition for their music. At the time, people lived and died over questions of musical authenticity across all genres, which made writing about music all the more exciting. But in the 2000s, all of that crashed, and Weisbard found himself in the middle of an industry’s demise. A growing Internet had made it increasingly difficult for print publications to be profitable and employ writers. Readers were becoming less and less interested in sweeping expositions or in reading about underground music in general. Music criticism, forced to respond, shifted, mainstreamed, and became shorter, glossier. Weisbard did two things. First, he quit, and then five years later he decided to write about music somewhere else—academia. Making the switch meant that he was able to continue to write about music without sacrificing the depth to which he had become accustomed. One particular question stood above the rest: How does one rewrite the history of popular music in such a way that it’s not represented by genres, or inherent qualities used to categorize music, but rather by formats, or constructed mainstreams designed to target specific populations distinguished by class, race, gender, and region? 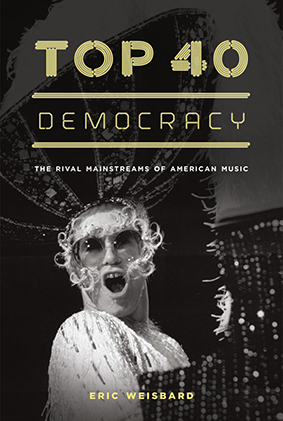 The answer formed slowly, but eventually became Top 40 Democracy: The Rival Mainstreams of American Music, Weisbard’s dissertation-turned-book that tells multiple histories of multiple formats side-by-side. The book has been featured in The Wall Street Journal, Salon, The Los Angeles Review of Books, and other publications. As a historian researching mainstream music, Weisbard faced a unique set of challenges. Although it has become cliché to say that popular music is everywhere, it is pervasive only online and in everyday life, but not in the archives or historical records where Weisbard was conducting his research. To write about a record label, he had to find an archive thatcontained a set of papers connected to that record label. To write about a radio station, he had to find someone who had held on to enough details about that radio station to serve as a source. He knew the general story that he wanted to tell, so writing the book was largely a matter of figuring out where to look for good stories that would paint a full picture. Given the challenges, he chose different sources for the different case studies for different reasons. For a chapter about A&M Records, he consulted a museum that had been given some 150 boxes of papers related to the label, which had been donated by Herb Alpert, the “A” in A&M. These gave Weisbard a backstage view of how record labels work. For a chapter about the Cleveland radio station 100.7 WMMS, he relied on the station’s longtime program director John Gorman, who had worked at the station from 1973 to 1987. Gorman saved all of the memos that he had sent to station personnel during those 14 years. Weisbard combed through those memos in Gorman’s basement. For a chapter on Dolly Parton, Weisbard visited the Country Music Hall of Fame. He also wrote chapters on the Isley Brothers, Elton John, and others. “The basic premise of the book is that American popular music, inspired by radio’s need to create music for a range of different local audiences, developed a unique approach to commercial culture by the late 1960s, one that has continued to this day,” Weisbard said. American pop, much like the stations that you choose between when you scan the radio, is not just represented by one format, but by a system of rival mainstreams: Top 40 hits, adult contemporary, country, rhythm and blues, rock, and others. “The center of music isn’t one thing; it’s an ever-changing range of mainstream approaches,” he said. And while some have criticized this segmenting of popular music, Weisbard argues that it’s a good thing, allowing diverse groups of Americans a sphere where their voices can be heard. The biggest difference between being a journalist and being an academic, and the most enjoyable part of making the transition, according to Weisbard, has been the drawn-out writing process. “It’s been really nice to be able to spend such a long time working on a single project after all of those years of turning around stories so quickly,” he said. He also has enjoyed studying popular music with his students. Some, he said, are astounded that they can take classes on their favorite bands. Others love the idea that that they can have deep conversations about music that involve issues of race, gender, and class. All are pushed to analyze songs and make arguments based on what they hear. “In my classes, we take advantage of two things that music offers: One, there are so many kinds of music that we can talk about almost any category of American life and find a musical example to go along with it, and two, songs are so short that if we want to talk about something, we can listen to a song for a couple of minutes before we dive in,” he said. In one exercise, he has his students make individual song presentations in which they each talk about one song at length. Weisbard says the exercise gets the students to “really live and inhabit a song,” which allows them to explore the song at one level in terms of meaning and message and another in terms of form. And like his book, the conversation’s direction is always dictated by the music.